I don't usually follow the Olympics closely, but these Games were different. 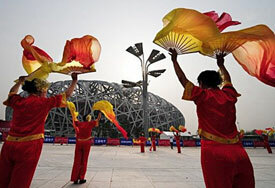 The 2008 Beijing Olympics were an event of great and unusual cultural, political, and economic significance to the world. Most commentary has naturally focused on the athletics, and I have not seen much serious analysis on these other topics. I decided to highlight the economic issues behind the Olympics. In the press, the Beijing Games were repeatedly termed China's “coming out party,” but I think that phrase trivializes what the nation has accomplished. China is no mere debutante dressed up for a ball, she is a powerful woman seeking global respect. She wants to regain the pride that was lost during the humiliation of the Opium War, when Britain not only forced China to pay for the illegal drugs she had destroyed, but also coerced her to give major territorial, legal and trade concessions. The status of China is radically changed today. The nation has enormous stockpiles of money from its manufacturing might, and the larger-than-life spectacles in the opening ceremony give a small demonstration on the power of 1.3 billion people when they work toward a common goal. China does not merely have a dominant Olympic team, but it is the third country to have a successful manned spaceflight. As Bob Costas pointed out in his interview of President Bush, America no longer has much leverage when it comes to pressuring the Chinese government. Much of the U.S. manufacturing base was outsourced to China years ago. America's trade deficit so far in 2008 is approximately US $481 billion. Even the 35% drop in the U.S. Dollar Index since 2002, and the controlled increase in the yuan has not been enough to make most American exports competitive with Chinese products. The U.S. economy is particularly vulnerable to a politically motivated sell-off of assets by a sovereign wealth fund, like the one run by China. According to a Congressional report released in January, “foreign investors now hold slightly less than 50% of the publicly held and publicly traded U.S. Treasury securities, 25% of corporate bonds, and about 12% of U.S. corporate stocks.” Overseas investors control over 44% of the U.S. national debt. These dangers to the financial system are not just theoretical. Since China has approximately $1 trillion in dollar denominated assets, last year two officials threatened the “nuclear option” of dollar sales if the Bush Administration did not reduce the level of political pressure. Then in August, Yu Yongding, the former advisor to the Chinese central bank, warned the Treasury Department not to let Freddie and Fannie fail. He stated that if “international investors are not compensated adequately, the consequences will be catastrophic,” implying retribution by China. The nation has been selling GSE bonds this summer, not trusting the implied backing of the U.S. government. I believe the economic actions of the Chinese government demonstrate its attempt to be mindful of the past, both its pitfalls and its glories. While it won't be bullied by other nations, the policy of economic decentralization shows it is trying to avoid the catastrophe of one misguided ruler sending the nation down the wrong path. Unbridled capitalism is bursting out all over the country under the slogan of Deng Xiaoping, “Poverty is not socialism. To be rich is glorious.” The ruling Communist Party could therefore justify liberalization of the economy without the political reform that one would expect to accompany it, as the Communists were not about to loosen their grip on power. While China has incredible potential in its huge population and manufacturing base, it also faces huge challenges. In order to feed and provide jobs for over a billion people, China now suffers from air pollution, deforestation, lack of clean water and other signs of environmental damage. China is now a net importer of food and energy. Most of the rural residents are poor and uneducated, and unrest over ethnic and economic issues simmers in the background. All these issues could seriously derail the spread of prosperity. However, one of China's traditional strong suits is planning. If they make intelligent decisions on handling growth similar to their policy of economic liberalization, the country will have become the dominant power of the 21st century. On the other hand, another Cultural Revolution would be disastrous. One of the reasons that commodities have declined so sharply is the mistaken belief that China must fall into a recession when the developed countries do. This is unlikely for several reasons. China's GDP grew 11.4% in 2007, so in order for a recession to occur (which requires negative growth), their economy would have to suffer a massive crash. In addition, China restricted industrial activity this summer to lower pollution levels and save energy for the Beijing Olympics. These constraints contributed to the seasonal weakness in commodities, but the resumption of factories will lead to a jump in demand. The nation is still urbanizing and industrializing, so it has a backlog of infrastructure projects to complete which will require tons of base metals and energy. Even if the West were to suffer a depression as bad as the Great Depression, 75% of the workforce would still be employed. If a sharp drop in demand occurred, China could still keep its population working by spending its current account surplus on developing the countryside, like FDR did with the Works Progress Administration in the 1930s. China is no longer dependent on income and goodwill from Western nations to keep its economy afloat. The Chinese saw the 2008 Beijing Olympics as their opportunity to send a message to the world about their reemergence. They set the tone for their global interaction with themes of diversity, harmony, and openness. Chinese society is rapidly evolving and while it is not without flaws, their success at reinventing themselves has been breathtaking. Although nominally Communist, investment great Jim Rogers calls the Chinese the “best capitalists in the world.” China is becoming a new superpower, and must be taken seriously. Nations must decide if they will struggle against China's rising strength, or work in harmony with the Chinese. Hello, I'm Jennifer Barry and I want to help you not only preserve your wealth, but add to your nest egg. How can I do this? I investigate the financial universe for undervalued assets you can invest in. Then I write about them in my monthly newsletter, Global Asset Strategist. Disclaimer: Precious metals, commodity stocks, futures, and associated investments can be very volatile. Prices may rise and fall quickly and unpredictably. It may take months or years to see a significant profit. The owners and employees of Global Asset Strategist own some or all of the investments profiled in the newsletter, and will benefit from a price increase. We will disclose our ownership position when we recommend an asset and if we sell any investments previously recommended. We don't receive any compensation from companies for profiling any stock. Information published on this website and/or in the newsletter comes from sources thought to be reliable. This information may not be complete or correct. Global Asset Strategist does not employ licensed financial advisors, and does not give investment advice. Suggestions to buy or sell any asset listed are based on the opinions of Jennifer Barry only. Please conduct your own research before making any purchases, and don't spend more than you can afford. We recommend that you consult a trusted financial advisor who understands your individual situation before committing any capital.